The question on everyone's mind is: Will Barakat be brave enough to alter his starting lineup? The squad selected is tried and tested so it will be interesting to see if the tactician alters the starting XI. Away trips in Asia are always tricky- especially without the help of charter flights- but at some point, depth needs to be cultivated. With less than 500 days to go to Asia's showpiece event, Palestine need to create competition for roster spots. Barakat does not have a great track record when it comes to squad rotation and this holds true of the friendlies played during his tenure. That said, what little rotation has taken place, especially in defence, hasn't always produced the desired result. Barakat's preferred pairing of Bahdari and Dheeb has been effective as the duo have kept a clean sheet in seven out of the eight matches they have been fielded. That duo is responsible for six of Barakat's seven wins at the helm. Barakat's most radical changes (Goalkeeper, Right Back, Midfield) were more or less forced by certain players losing form or fitness. In attack, Matías Jadue hasn't been on the pitch for Palestine since November 2015 and Ahmed Awad (edit: Awad has pulled out with a muscle injury) has been on the pitch for less than 40 minutes in his two appearances. 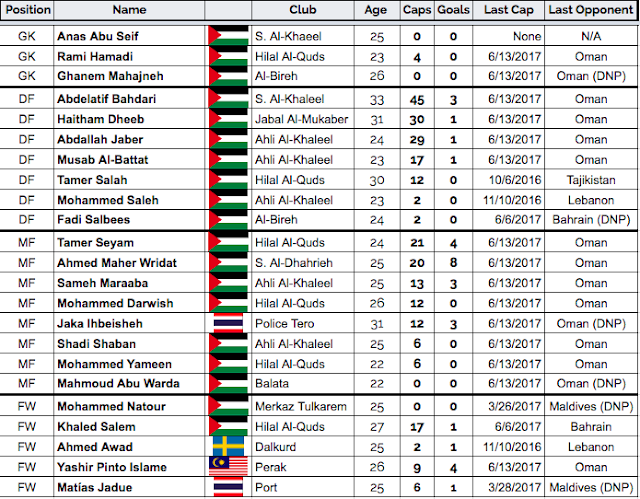 The likes of Jaka Ihbeisheh and Ahmad Maher have yet to start a game in 2017. Granting each of them a chance to play on the wings in place of Tamer Seyam and Sameh Maraba should be considered seriously given their form at club level. Provided the game goes to plan- this should also be the game that allows Mahmoud Abu Warda to make his debut with the senior team following a sensational performance in guiding the Olympic team to the 2018 AFC U22 Championship finals. Will Alexis & Pablo make the trip? Barakat has also called up Alexis Norambuena and Pablo Tamburrini into the squad and although it remains to be seen if they will make the trip. 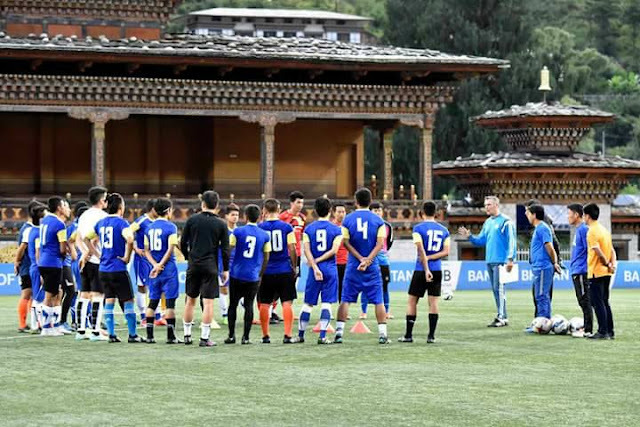 It would take the South American based duo a day and a half and three separate flights to get from Santiago to Bangkok to meet with the team for their ongoing flight to Thimphu. Norambuena- the second oldest player in the squad- remains a big part of Barkat's plans and he will be encouraged by the fact that the fullback has found regular playing time with Deportes Melipilla. With a dearth of options at right back, Norambuena can still provide the team with stability as the transition is made to Mus'ab Battat. His superb performance against Saudi Arabia during World Cup qualification is what he will need to replicate in order to push for a starting role in the team. The presence of Tamburrini was a hallmark of the Barakat era but that has changed due to the player being out of form. In his absence, Shadi Shaban and Mohammed Yameen have shown their ability to fill the gap next to Mohammed Darwish. If he does make the trip to Bhutan, will Barakat even play him? Palestine seized full control of Group D in June following a 2-1 home win against Oman. The result all but confirms Palestine's place at the 2019 AFC Asian Cup in the UAE. According to simulations conducted by Football-Rankings.info Palestine's chances at qualifying before the draw stood at 80.04%. A relatively easy group further boosted their chances- with the site giving them a 94.49% chance of going through. Wins against Maldives and Oman further boosted Al-Fida'i's chances- with the side qualifying in 99.96% of simulations. The question on everyone's mind is: Can Palestine beat Bhutan by a 12-goal margin and set a record for largest win in national team history? Yes, chasing goals is important, but the team and the staff should make sure everything is in place to get the result. This is not a foregone conclusion- no game is. Palestine nearly brought a premature end to their World Cup dreams against Timor Leste two years ago. Yes, Timor Leste cheated by fielding nine ineligible players but that result was also the byproduct of horrible planning: the travel itinerary was exhausting and convoluted, the game plan was overly cautious, and for large periods of the game- the players were flat. That cannot happen again in Thimphu. The team must ensure preparation and execution is as good as it was in June versus Oman. They also need to keep in mind that Bhutan will not be as incompetent as they were in Muscat. That said, if the squad executes- then the three points should be all but a formality. German national team manager Torsten Spittler has called up seven new players into his national team squad. The last time out, Bhutan were defeated at home by Maldives who scored twice in the second half to ensure their first points of the campaign. Bhutan will be looking to improve through exposure during the campaign. The fact that they navigated a path to the third round of qualifying is mightily impressive. Consider that Bhutan- a nation of less than 800,000- dispatched Bangladesh- a nation 168 million to get here. Spittler, said that the huge loss against Oman was a one-off. “I am still confused. I don’t remember what has happened in the match against Oman,”. “The situation has become difficult for us. Palestine is a physically strong team and they have the height advantage. We have to prepare… We are aware of the situations and will work against it,” said the coach. Bhutan will rely on Chencho Gylthsen for goals and the 21-year old striker has managed an impressive nine tallies in his 25 appearances. Bhutan's biggest margin of defeat at home during the combined World and Asian Cup qualifiers was 6-0 loss to China. Qatar were 3-0 winners in Thimphu while Maldives (in the World Cup stage) huffed and puffed to a 4-3 win. Hong Kong were 1-0 winners only by virtue of an 89th minute winner.